The single statue fronting the Oude Kerk is a simple stylized image of a cloaked woman, Geertroyt van Oosten ( 1320-58 ). Born in Voorburch Holland, she was devout from childhood. The single statue fronting the Oude Kerk is a simple stylized image of a cloaked woman, Geertroyt van Oosten ( 1320-58 ). Born in Voorburch Holland, she was devout from childhood. The Delft city hall, which underwent a 20th C restoration to the original Renaissance architecture, dates to the 17th C and architect Hendrick de Keyser following a fire in 1618 which destroyed an earlier building, The red shutters are iconic. The Gothic tower at the rear is a 13th C limestone-covered structure which survived the fire and was used as a prison ( among other occupants Bathasar Gerard ). The clockface dates from 1536. Below the coat of arms is a statue of Justice. Oostpoort can be translated as East Gate and is the last surviving of the city’s former five city gates. Built around 1400 in brick Gothic style, the gate was used not so much as a defense structure, but nonetheless has its embrasures. Nowadays, it’s a luxurious apartment and makes for a very nice photo. The other gates were torn down in the 19th century. Hugo Grotius (or Hugo de Groot) is considered as the father of international law. He was born in Delft in 1583 but was arrested together with van Oldenbarnevelt. Grotius legendary escape from prison (in a wooden box) is well known in the Netherlands. A statue of Grotius is situated in front of the Nieuwe Kerk at the market. His tomb is in the Nieuwe Kerk. Build in 1505 this building has seen some history. 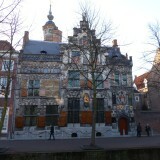 It started out as a private house but housed among others the Court of Holland during the rise of Holland. It also was the home for Filips, count of Hohenlohe who was married to the daughter of Wiliam of Orange.In 1652 it got the function it has still today. Located at the center of many Low Country medieval cities, weigh houses were buildings for public control of the weight of goods, both for the safety of the principals in a transaction and also for establishing appropriate taxes. Elsewhere in Europe, this function took place in town or guild halls. Weigh houses were also used in the 16th and 17th C to weigh the accused versus a set weight – guilty if the accused was too light. The legacy of Johannes Vermeer is celebrated in a scaled reproduction of the building occupied by the Guild of St. Luke just one block off the Markt in Delft. With no more than 34 authenticated paintings and perhaps 10-20 gone missing, his work is ranked with painters with far more existing works. Around 1505 the house of the very wealthy Jan de Huyter, he was chairman of the polder board of Delft, was furnished with a façade of natural stone and a tower…. The house of the V.O.C.